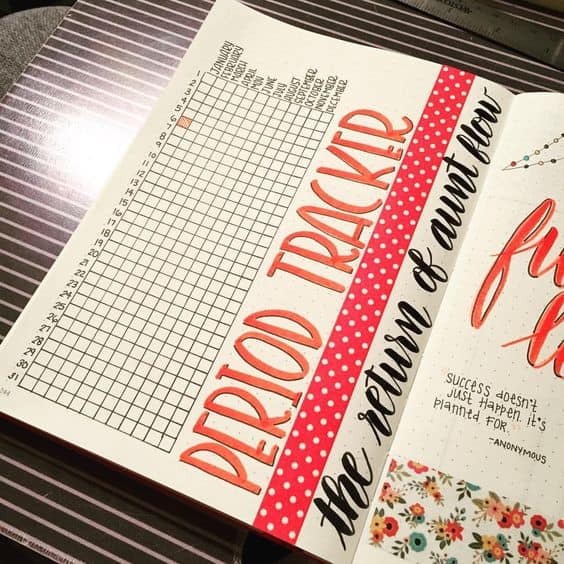 Your bujo can be used for so much more than just keeping on top of your to do list. 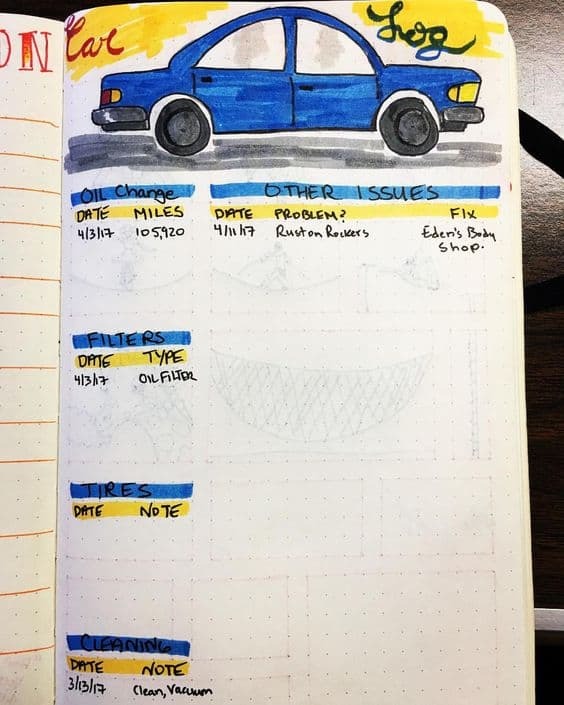 Get inspired by these bullet journal tracker ideas for 2019: tracking layouts and collections that will rock your world! 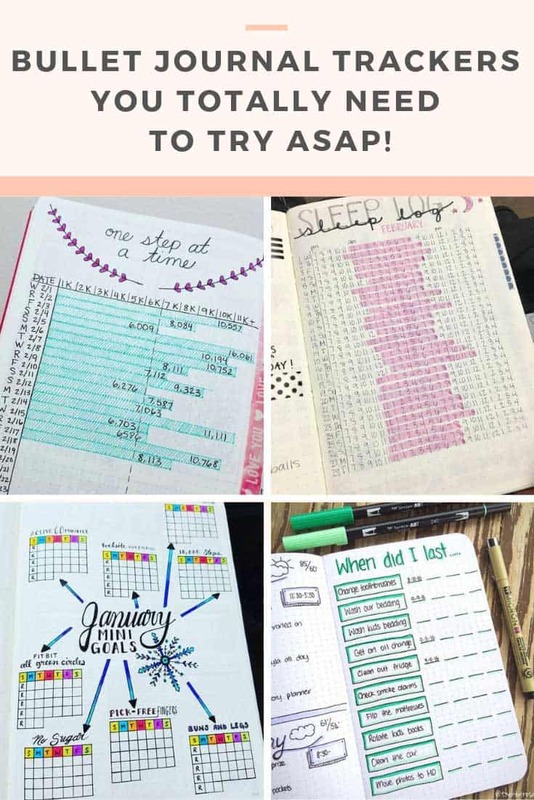 Whether you’re new to the whole Bullet Journal set up or you’re ready to take your planning to the next level you will be totally inspired by these Bullet Journal tracker ideas for 2019! 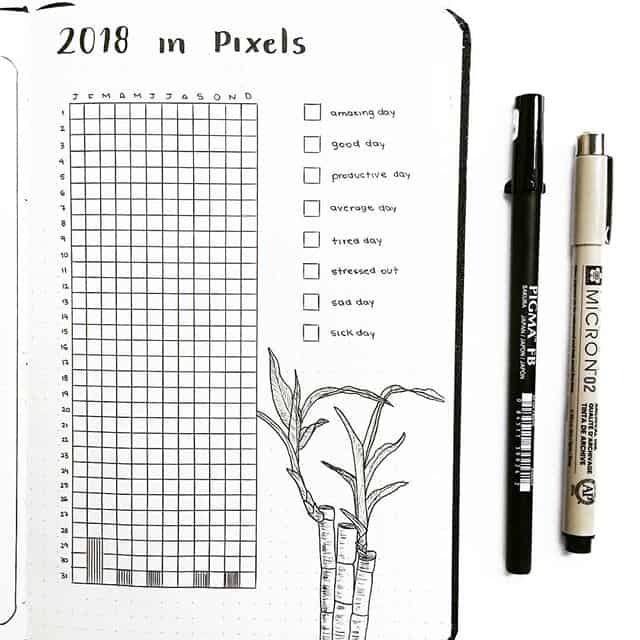 From tracking your sleep and your daily steps to monitoring your migraines and remembering when you last changed the oil in your car, there is a creative tracker layout here for everyone to use in your 2019 bullet journal! Just getting started? 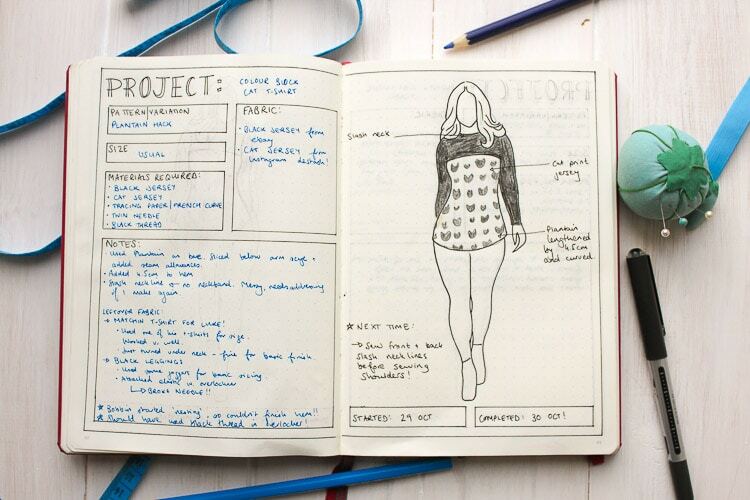 You should totally read our How to Bullet Journal guide! 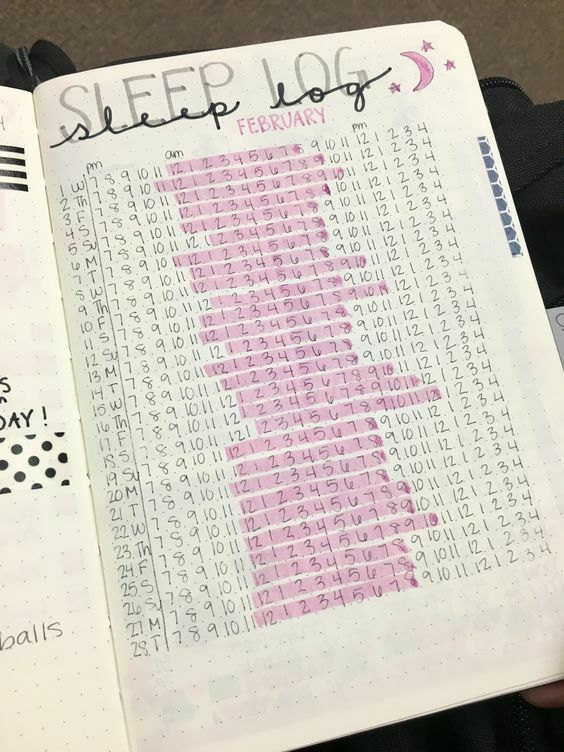 Your Bullet Journal is a great place to keep track of your health and overall wellness, here are some ideas for recording your sleep patterns, doctor’s appointments and monitoring your migraines. Sleep, it’s the one thing most of us want more of! And of course lack of sleep leads to irritability so its a good idea to track your sleep patterns and see how much you’re actually getting each night! 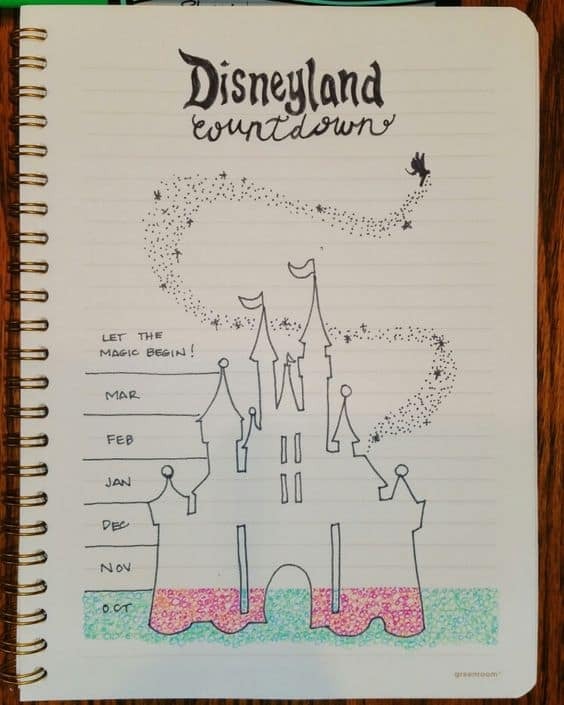 If you have children think about tracking their sleep patterns in your BUJO too. My son is a terrible sleeper and when he goes through a bad patch I whip up a sleep tracker spread to monitor what’s going on. Keeping track of your family’s doctor appointments is also a good idea. I like how this layout covers several years on one page which is perfect if you don’t have to visit them too often. 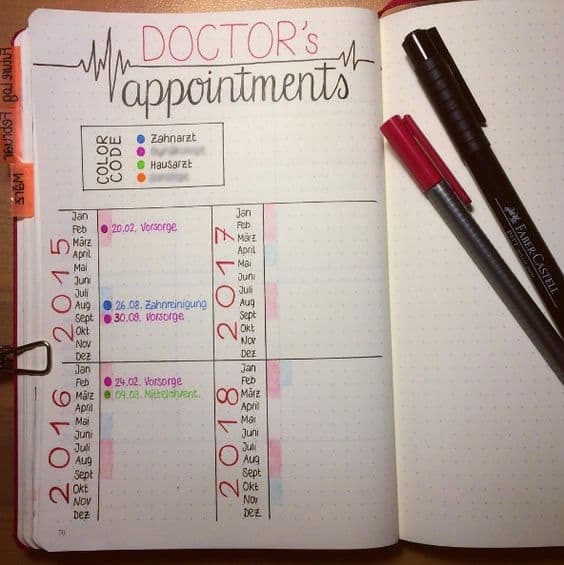 Tracking doctor and healthcare professional appointments is even more important if someone in your family has a health condition that requires regular monitoring or treatment, in which case you might want to dedicate a whole page per calendar year. 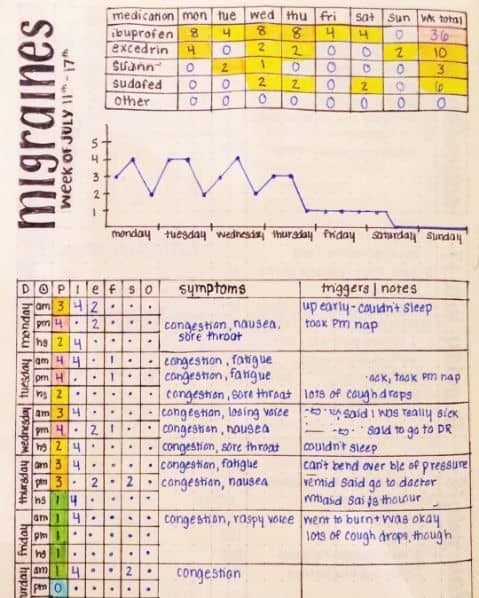 This is an excellent tracker layout if you suffer from migraines and want to be able to track your symptoms and triggers. It will help you to make sure you take your medication properly too. What are your fitness goals for the coming year? 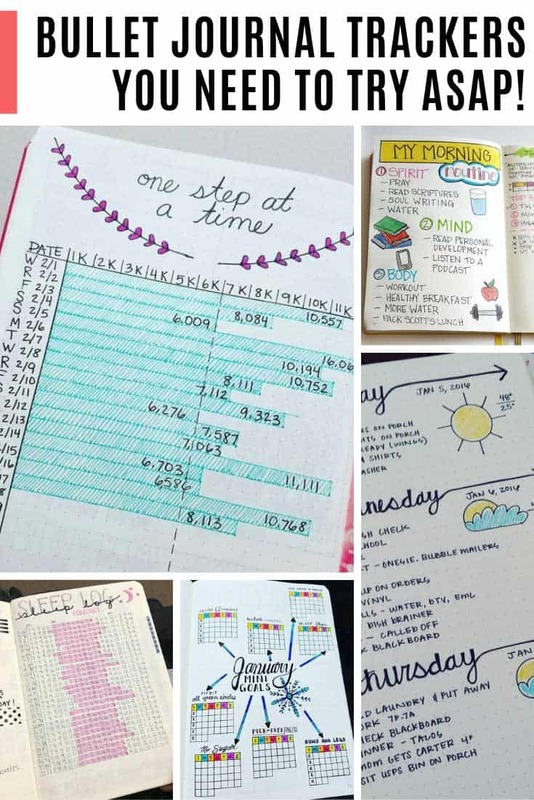 Whether you want to track your fitness routine, up your daily step count or lose some weight these creative bullet journal layout ideas will help you get going! Challenges are a great way to motivate you towards meeting a goal, and you can take part in an official challenge, join up with some friends or just go ahead and challenge yourself! 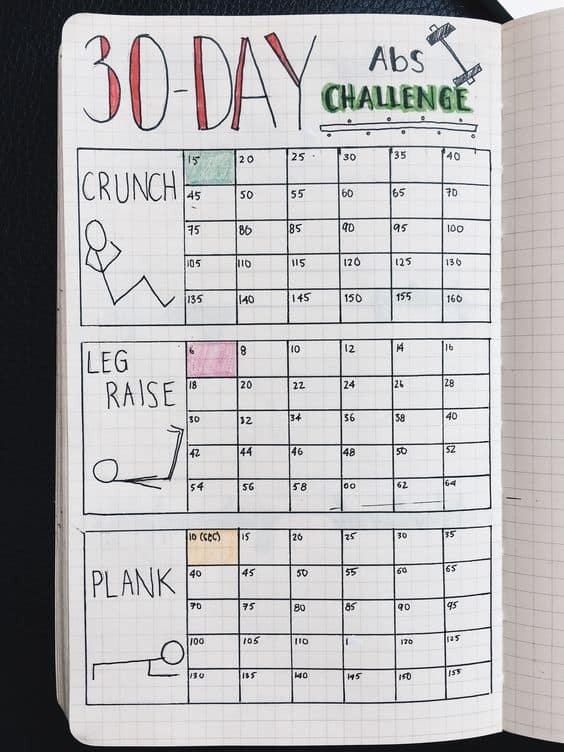 This tracker is a simple way of monitoring your progress towards three fitness goals. If you want to increase your daily step count try a layout like this step tracker. I like how they put their daily goal as a line down the middle but left room to exceed it for those days when you can walk more than usual. Oh and I used to try and track my steps with my iPhone but I much prefer my Fitbit Charge 2. Seeing my step count every time I check the time is pretty motivating, and I love how it prompts me to get up and move once an hour. I love this weight loss tracker spread with it’s built in rewards to celebrate your progress along the way! 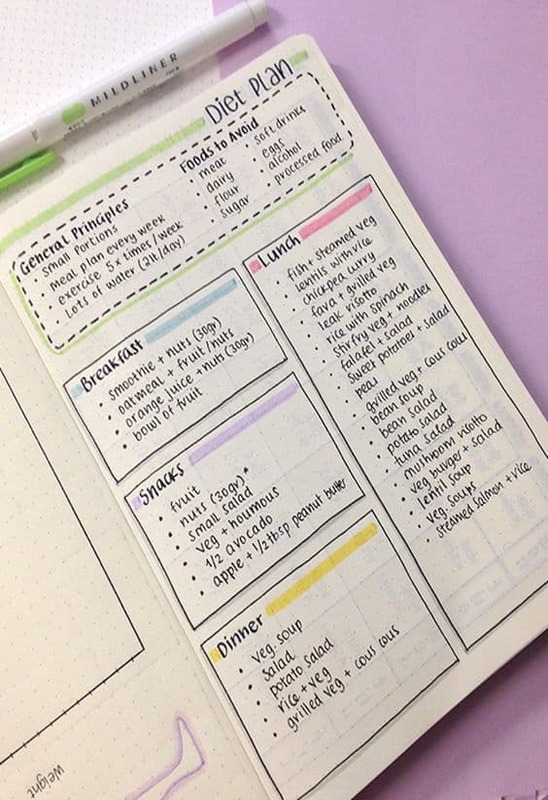 Here’s a set of Bullet Journal tracker ideas to help you organize meal times and make sure that you and your family are eating healthily. This tracker was created as a diet plan, but don’t scroll past if you’re not “on a diet” right now. It’s also a really useful layout for a weekly meal plan whether you’re meal prepping, Keto-ing, Whole 30-ing, or just planning out what to feed your family this week! 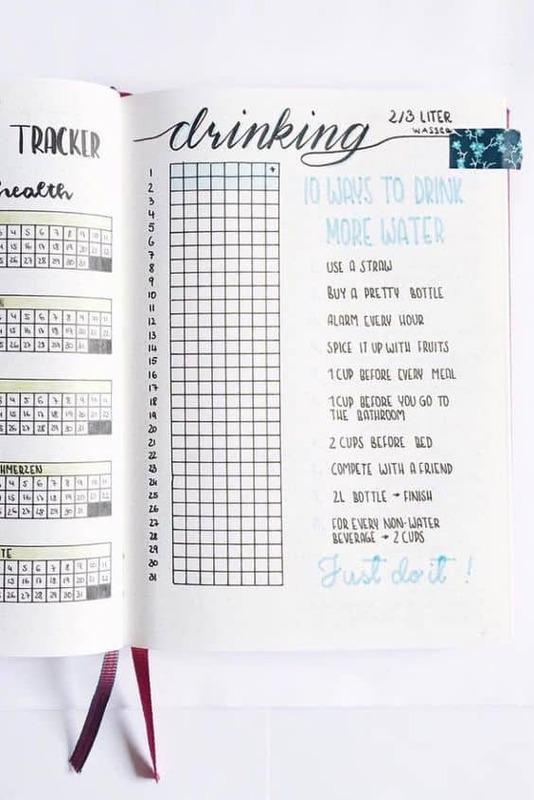 If you need to drink more water it’s a good idea to track your daily intake on a water tracker spread like this one. I like how they included “10 ways to drink more water” to inspire them to build the habit! If you want to start some more good habits check out our collection of Bullet Journal Habit Tracker Layout Ideas! As Bullet Journal hacks go this meal planning one is pretty genius… build a recipe bank in your BUJO using colourful sticky notes! Don’t forget that your Bullet Journal can also be used as a diary and these are my favorite spreads and collections for keeping track of the things that are important to you right now. This layout is actually a Bullet Journal printable and you can get a copy right here. 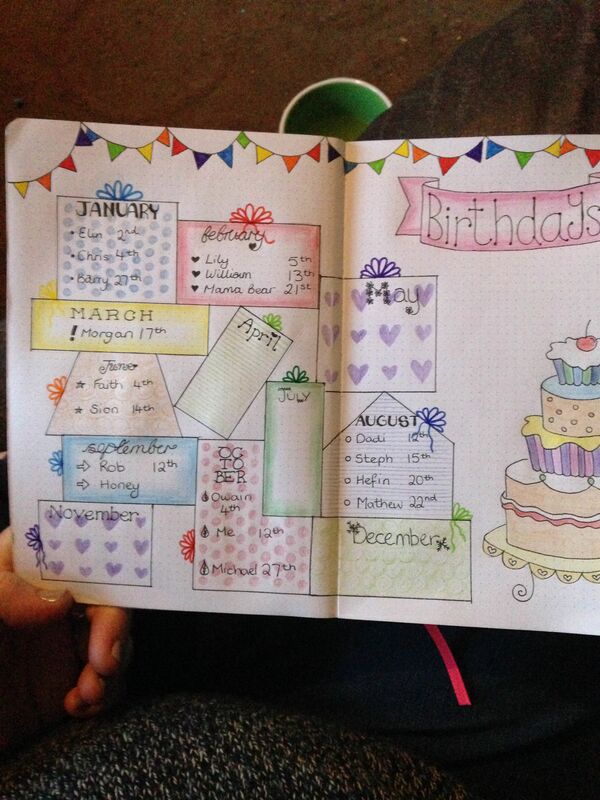 I love how this simple one page spread lets you journal what life looked like this month in 12 different areas. 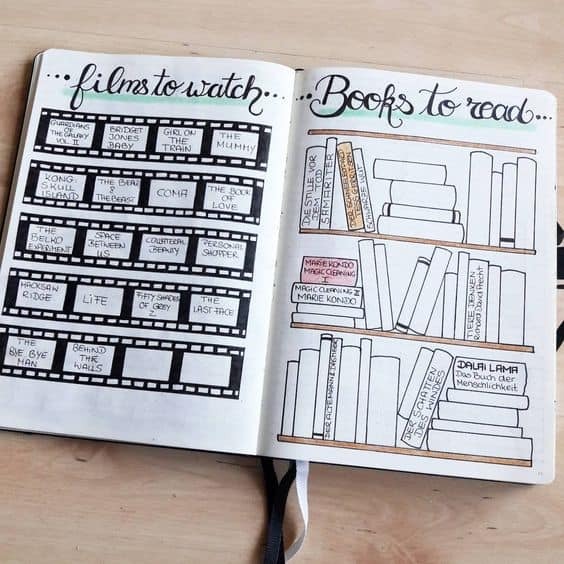 If you’re big on movies and you want to write out a bucket list, or just record them as you see them this cute movie tracker layout is a good way to do it. 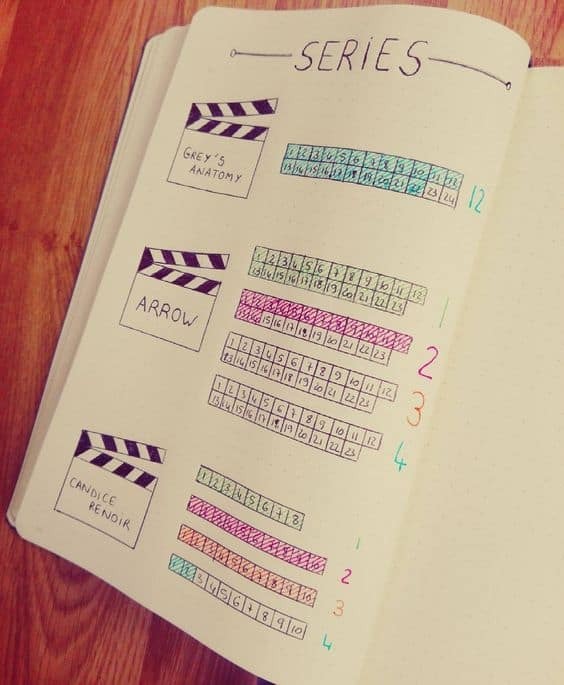 If you’re like me and can never remember which episodes you’ve seen of your favorite TV shows then try a TV tracker spread like this one. 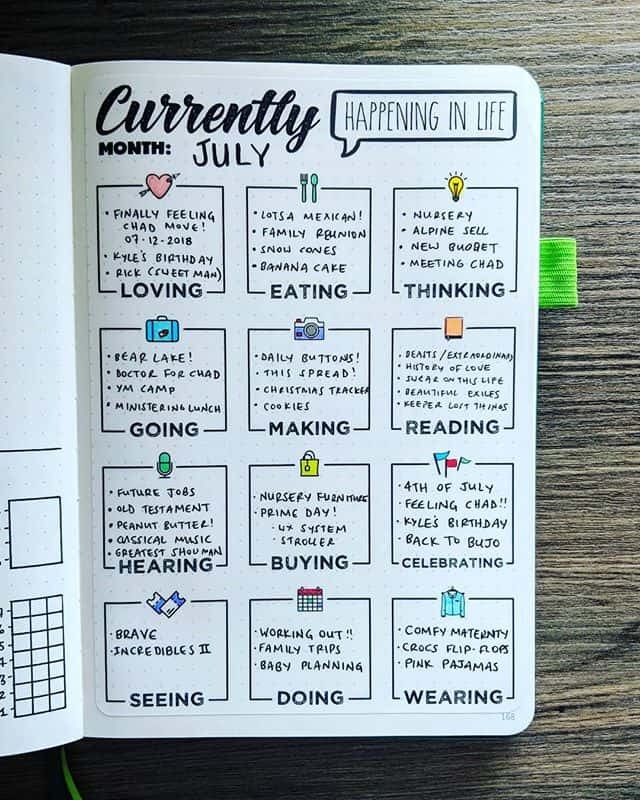 For more inspiration check out our collection of bullet journal tracker ideas for keeping track of what your life looks like right now! If you’re a keen crafter you can use your Bullet Journal to note down the projects you are working on and track your progress. I like this two page layout because it has room for a picture. Self care seems to be a bit of a buzz word right now but it really is so important to look after our mental health as well as our physical health. The following spreads, collections and trackers are a great place to start. 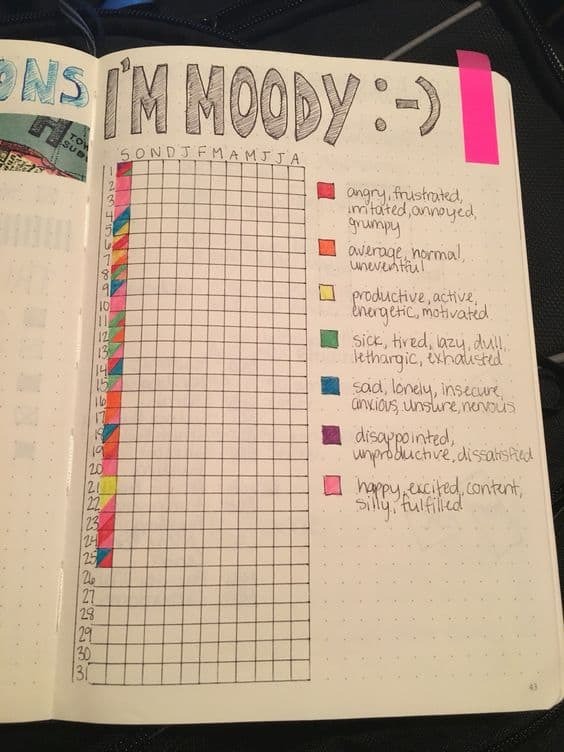 Tracking your mood is important for emotional health and this simple layout is a good place to start. Or you could try a more minimalist layout like this one. And it’s always a good idea to note down memories and milestones, however small, to keep your mind positive even on the bad days. 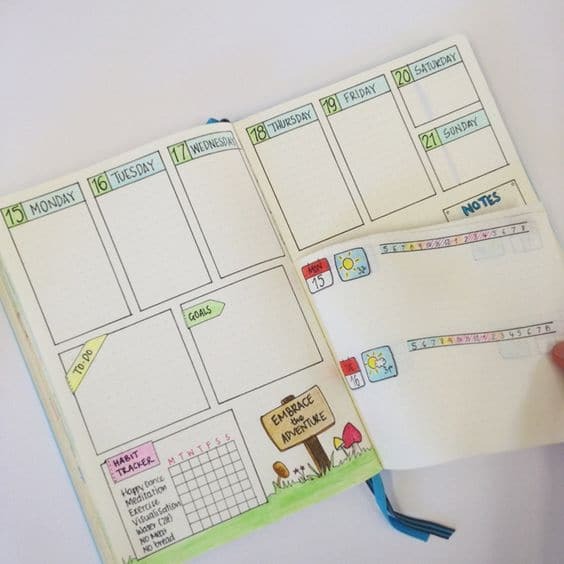 Don’t miss our collection of Bullet Journal mental health layouts for more inspiration. If you’re a regular traveller you’ll probably want to start a standalone travel journal, but if your trips are less frequent you can plan and track them right there in your Bullet Journal. A countdown is always fun especially when you’re counting down to a Disney vacation! 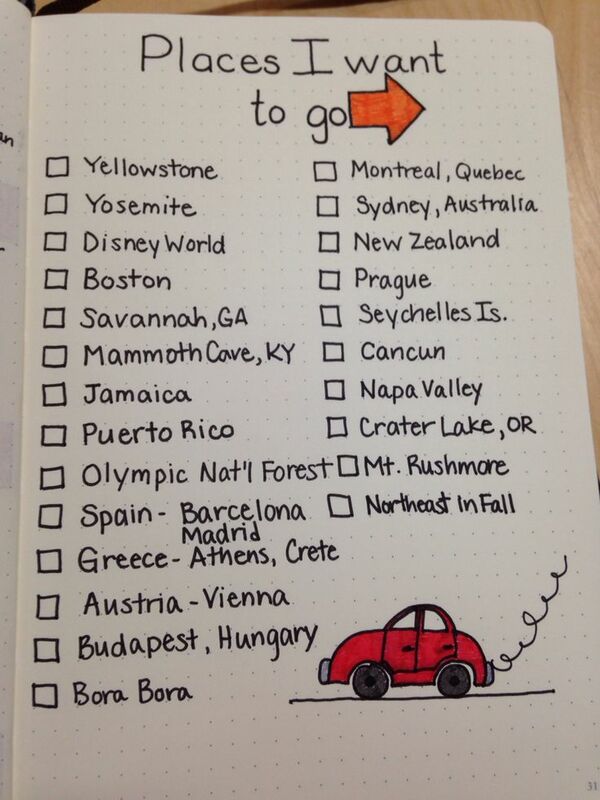 Or how about setting aside a page to write out your travel bucket list, and include those all important boxes so you can check them off as you visit! Your Bullet Journal is also a useful place to monitor your budgets and expenses, since you have it right there with you all day. This set of tracker spreads is pretty all-encompassing when it comes to tracking budgets. You can see how you could set out spreads for monthly bills and subscriptions, no spend months and savings goals. 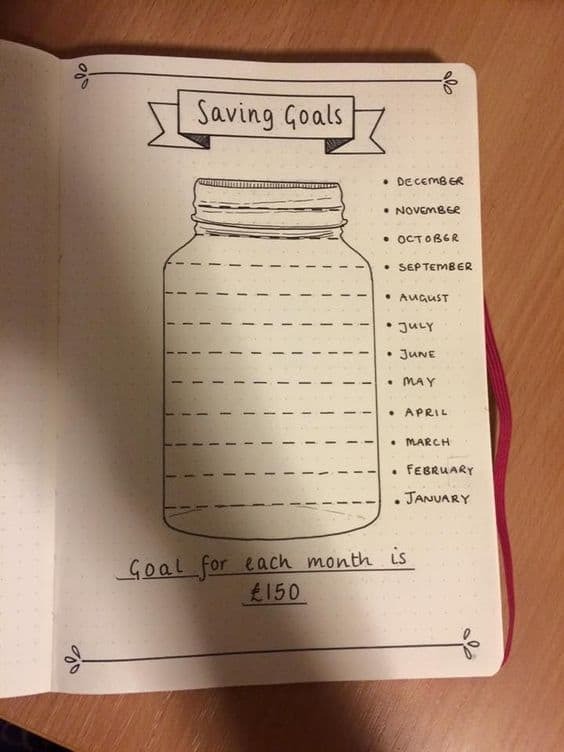 We have a brand new collection of Budget Tracker Bullet Journal Ideas for you to help you keep track of your finances in 2019! Speaking of savings goals, you might want to set aside a whole spread for those. I love this one with the picture of the mason jar that you fill up as you go through the year! 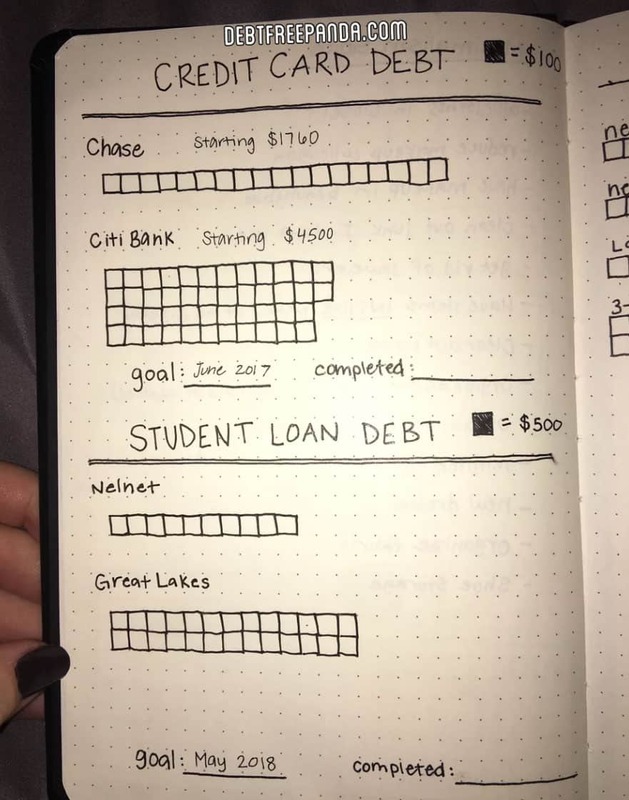 If you’re following the Dave Ramsey method to pay off your debts then try a tracker spread like this one to monitor your progress. 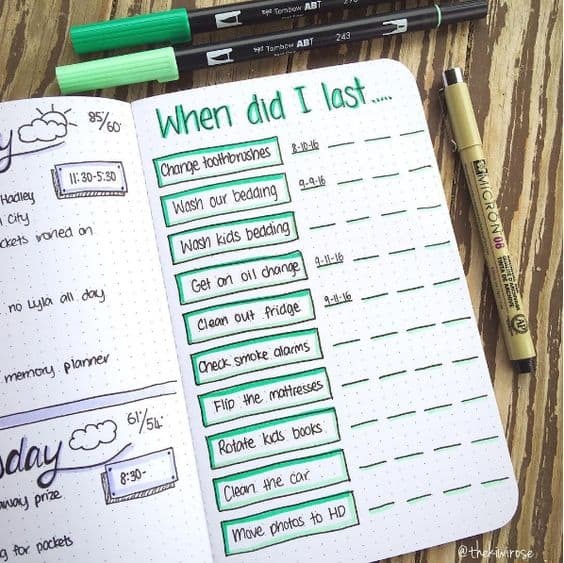 If you have trouble staying on top of your household chores it might be time to pop some goals and schedules into your Bullet Journal to remind you what you need to do! I like this master chore list spread so you can see at a glance which tasks need doing and how often. 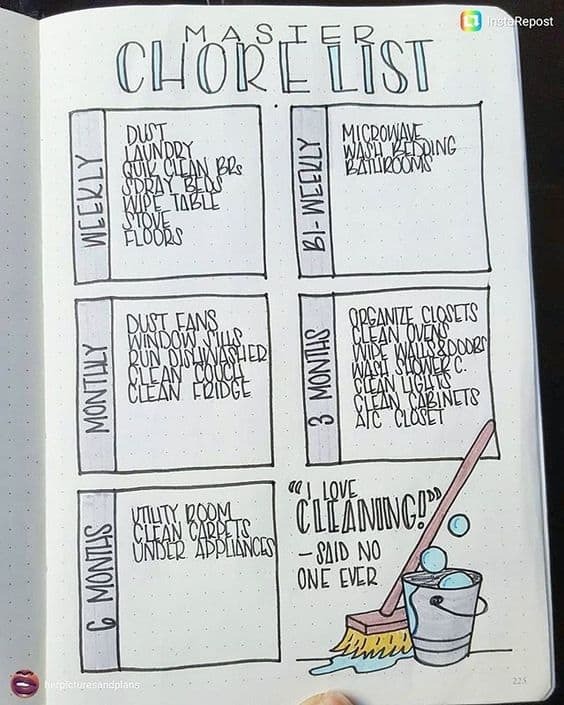 Don’t miss our collection of Bullet Journal Cleaning Schedules to keep your home spick and span! Or how about a spread like this to remind you when you last changed your oil or check your tyre treads. And I think this “when did I last…” tracking spread is really useful for those random household tasks that need to happen at regular intervals like checking the smoke alarm or flipping your mattress. 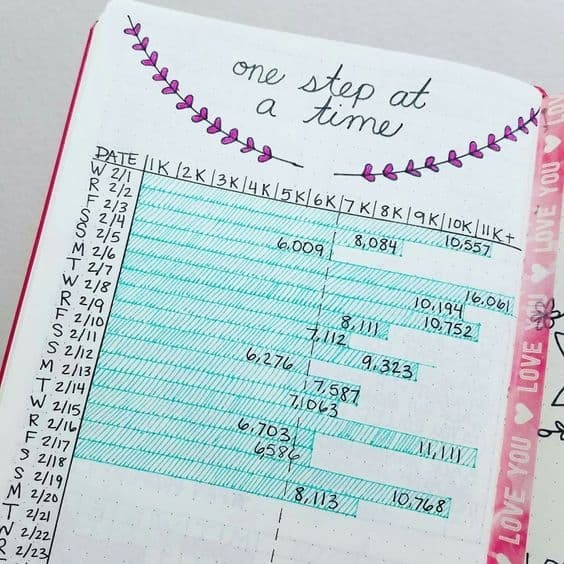 Using your Bullet Journal to track your time and your goals is probably the most obvious so here are some creative ideas to help you decide how to do it. I LOVE this mini goal tracker! 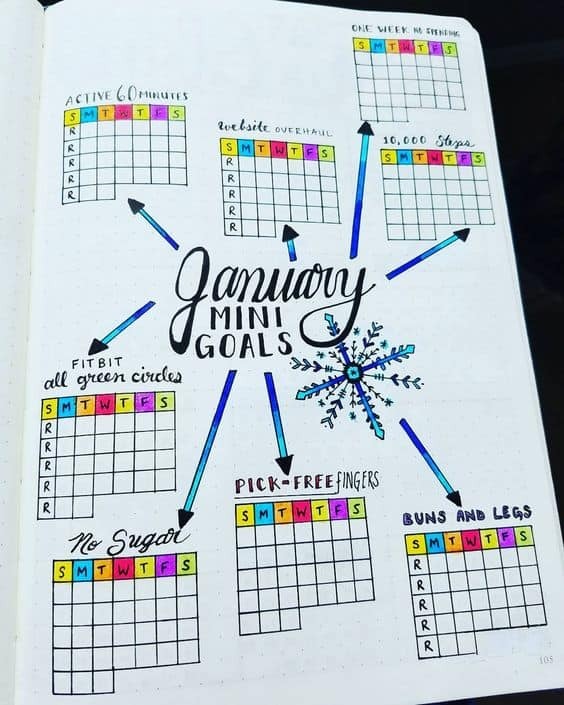 Create one at the start of each month and then pick out your mini goals that you want to track progress against! 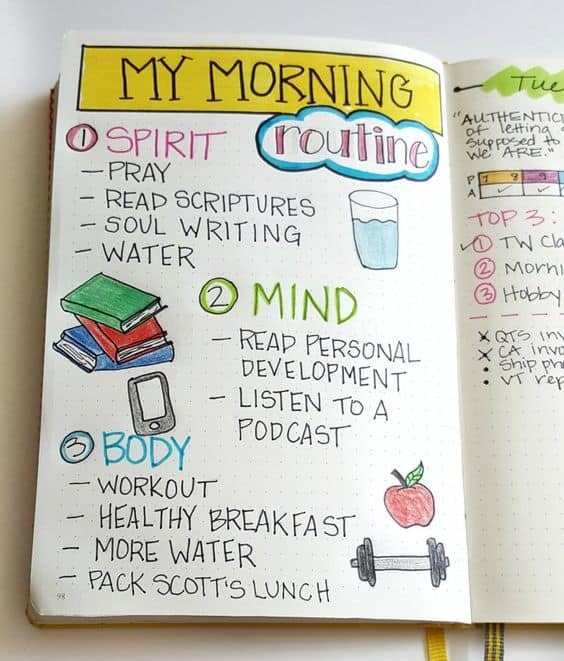 Having a morning routine is a good way to start your day positively and efficiently, and if you need to get into the habit of doing it right it makes sense to write your plans out in your journal. It can be all to tempting to fill your year-at-a-glance or calendex spread up with birthdays and anniversaries (I know I did it) but it makes things so cluttered, I personally find it better to use a birthday tracker spread instead. And besides doing it this way lets you be more creative! I haven’t tried the dutch door hack yet because I haven’t been brave enough to take a pair of scissors to my Bullet Journal! but it sure is a clever way to create extra space in a weekly layout. Speaking of hacks and goal setting we have a whole collection of Bullet Journal goal tracker hacks if you need some more inspiration! The easiest way to take the stress out of Christmas is to plan, plan and plan some more! And your BUJO is the perfect place to do it! Planning out your Christmas gift shopping list is a good place to start. I like how this tracker leaves room for you to assign a budget for each person on your list! 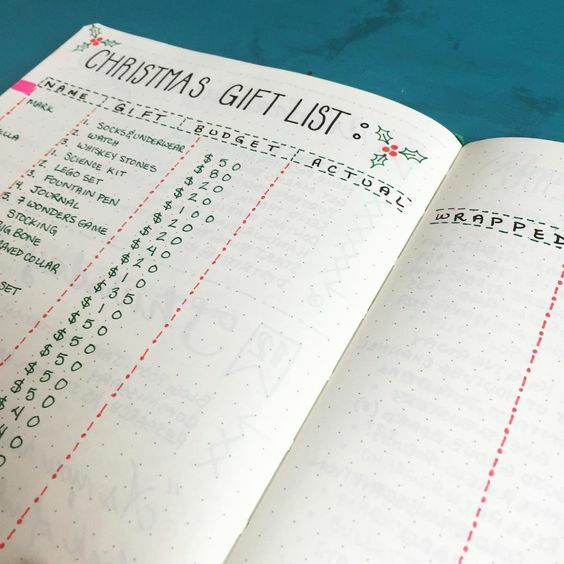 And because we love planning for the Holidays so much we have a whole collection of Christmas Bullet Journal ideas for you! And now for the female health trackers. 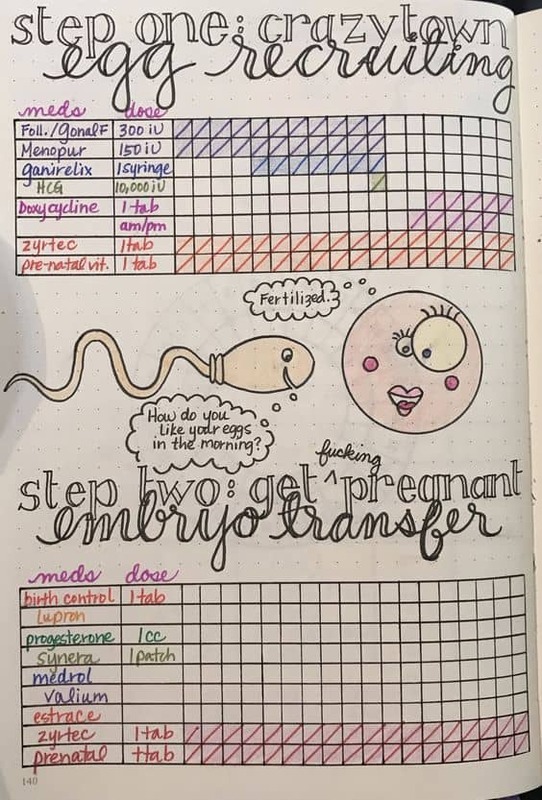 Whether you’re trying to get pregnant, monitor your nursing schedule or just know when to expect your period these creative layouts should give you some ideas! A simple pixel grid style chart is one of the easiest ways to track “the return of aunt flow”! I wish I’d had a tracker like this when we were going through out IVF program because it sure was confusing keeping up with all the meds! 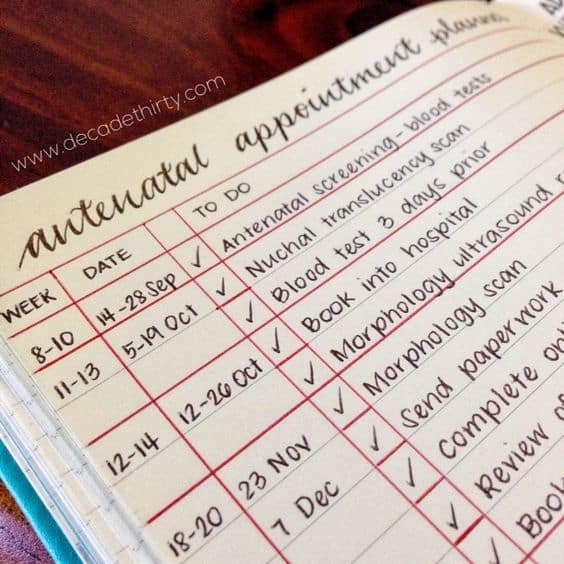 And when you have a list of ante-natal appointments as long as your arm it makes sense to keep track of those in your Bullet Journal. Keeping track of your left and right side is important when you’re nursing, and this is a pretty humorous way to do it! And let’s finish up with some random Bullet Journal tracker ideas that didn’t fit in any of the other sections! 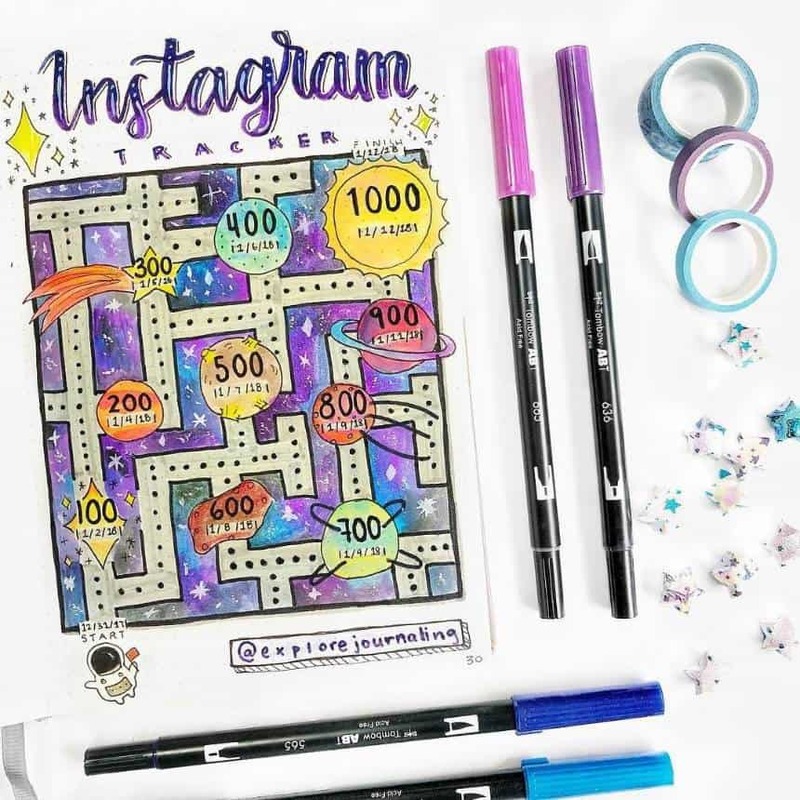 I love this Instagram tracker layout because it reminds me of PacMan! 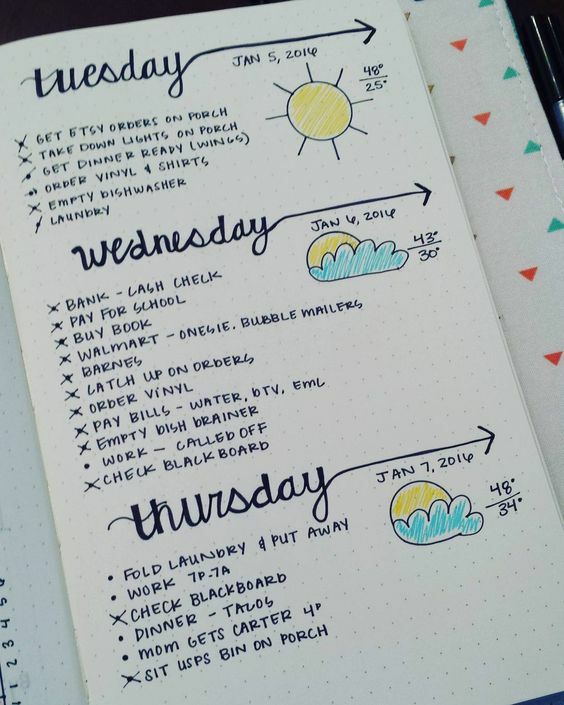 This is a fun and easy way to track the weather by doodling right there alongside your daily log!